CURRENTLY READING Why Are Google Employees So Damn Happy? Why Are Google Employees So Damn Happy? Working at Google is awesome; everyone knows that. The Mountain View campus has a slide that employees can use instead of taking the stairs. The East Coast headquarters features Lego stations, Ping-Pong tables, and a secret ladder that runs between floors. Employees at both offices are treated to (free!) healthy snacks like dried fruit, KIND bars, and coconut water. It’s also common knowledge that Google is a multi-billion-dollar company with thousands of employees worldwide. They can afford that slide, and those Ping-Pong tables, and those expensive brand-name snacks — basically, they can pay to keep their employees healthy and happy. So when we visited Google’s New York City offices last month, we went into it a little jaded. What lessons could a small, scrappy (but incredible!) startup like Greatist take home from one of the biggest tech companies in the world? Seriously, what were we going to do: Move out all the desks and build a giant slide in the middle of our small Flatiron office? But despite our initial skepticism, we learned on that visit (and from speaking with Googlers in the following weeks) that Google’s company culture is actually focused on simplicity. Most things that keep their staff happy and healthy are things that any company, of any size, can replicate — if they’re willing to make employee wellness a priority. After stepping out of the elevator, we met our energetic tour guide, Chrissy Persico, a Consumer Media Manager at Google. Right away she led us to one of the company snack stations, where rows of transparent glass jars held trail mix and dried mango rings and a section of opaque Lego-themed jars housed cookies and candy. The idea is to keep less nutritious items out of sight, so when you go for a snack, you’re more likely to grab a banana than a chocolate bar. Later, in one of the company cafeterias, Sophia and I wandered wide-eyed through the salad bar, where ingredients are color-coded according to their nutritional value (croutons are red, meaning “not so healthy”; lettuce leaves are green, meaning “good choice”). Neither of these ideas (hiding candy or labeling food) is especially incredible, but they can make a whole lot of difference during a moment of mindless snacking. And best of all, they seem easy enough to implement that any company could follow Google’s lead. As we walked through the hallways, nearly sprinting to keep pace with Persico, we noticed that no one was using the kick scooters that are readily available to make getting to meetings faster (and more exciting). Nor was anyone working out on the treadmills in what looked like a rec room on one of the lower floors. (Google’s New York City office doesn’t include a full fitness facility, but employees get subsidized memberships to outside gyms.) Persico pointed out the special ladder that takes more adventurous employees from floors four to five, tempting us with its emptiness. And later, when we spoke with other Googlers, no one mentioned the scooters, or the Legos, or the Ping-Pong table. No one even mentioned the slide. Instead, one Googler wanted to talk almost exclusively about how much he loved his standing desk. Aaron Stein transferred to New York City from Google’s Mountain View campus about three years ago, and he requested a standing desk after injuring his back. (Googlers have to fill out an application for a standing desk, although an injury is certainly not a requirement.) Since using one, he’s discovered that it not only lessens his back pain, but it also makes him a more productive worker. “One thing it does is make me more prone to walking around and kind of talking with [my] colleagues,” he told us over the phone. Standing desks boosting collaboration is something we’d heard before — Chrissy explained over lunch that when she was already standing, she was more likely to walk over to coworkers to talk through a problem or brainstorm. Newton Cheng, Google’s Fitness Programs Manager, talked more about happiness and why it’s essential to the company culture. Cheng oversees health and fitness programs mainly for Google’s North America locations, like the new dance classes offered at some Google locations. “We know that if we can help someone be happy, it supports their ability to be innovative and creative,” he said during our phone conversation. We went into Google expecting to feel intimidated and super-impressed by the tech mega-corporation’s sweet workspace, but we ended up with some fairly actionable takeaways. From what we observed, you don’t need a fancy slide, a table of Legos, or a fleet of scooters to make happy, healthy employees. Google’s most effective (and imitable) strategies seem to be its simplest: encouraging workers to get off their butts and eat healthier around the office. The best part about our visit? We learned that even teeny-tiny companies with fewer resources (we can think of a few) can effectively encourage workers to improve their overall health and wellness Effectiveness of a worksite wellness program on health behaviors and personal health. Merrill RM, Anderson A, Thygerson SM. Department of Health Science, College of Life Sciences, Brigham Young University, Provo, UT, USA. Journal of Occupational and Environmental Medicine. 2011 September; 53(9):1008-12. . 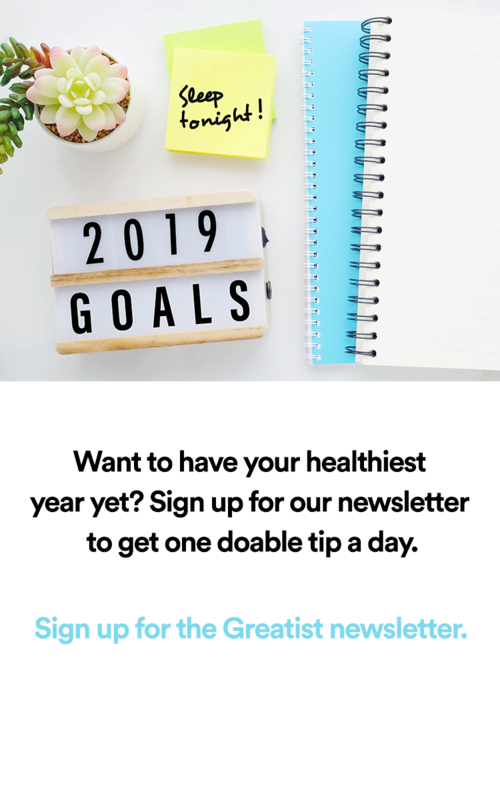 Supporting and rewarding healthy choices can include initiatives such as reducing health insurance premiums for employees who log a certain number of exercise hours each month, offering contests and giveaways for filling out personal health questionnaires, or even doling out cash rewards for maintaining a healthy weight. After all, it’s in a company’s best interests to have healthy employees — studies show companies that promote fitness and health actually save money on healthcare costs in the long run Wellness programs on the rise. Rossi, A. Biotechnology Healthcare. 2010 Spring; 7(1):29-30. . Plus, in general, healthier workers are happier, and best of all, more productive Health and productivity as a business strategy: a multiemployer study. Loeppke R, Taitel M, Haufle V, Parry T, Kessler RC, Jinnett K. Alere Brentwood, TN, USA. Journal of Occupational and Environmental Medicine. 2009 April; 51(4):411-28. . Google’s policy on standing desks in particular underscores how the tech giant understands the link between work and wellness. People who use standing desks burn more calories and use more muscles than those who use sitting desks, so standers are likely healthier than their sedentary counterparts Difference in caloric expenditure in sitting versus standing desks. Reif C, Marlatt K, Dengel DR. School of Kinesiology, University of Minnesota, Minneapolis, MN, USA. Journal of Physical Activity and Health. 2012 September; 9(7):1009-11. . While special remote-controlled desks and free lunch for every employee might be out of the cards (and the budget) for many small companies, improvising a standing desk is easy. Stick a stool, sturdy box, or even a pile of books atop a normal desk and get off your duff. (We do this all the time at Greatist HQ!) Likewise, most companies can’t afford to scatter brand-name coconut water and granola bars around the office. Instead, ask employers to stock a vending machine or snack area with healthier options to make smart snacks available at all hours. We can’t all work at Google, but some of their awesome health perks are easy to replicate in any workplace. After all, they say imitation is the sincerest form of flattery. Stash healthy snacks in clear glass or plastic containers. (Think nuts, fruit, and protein bars.) Keep less-wholesome options like candy or chips in opaque boxes or jars. Make a DIY standing desk. Grab a crate, a stack of books, or a stool and raise your workstation to chest-height. Move more throughout the day. Scooters might be out of the question, but anyone can take a short walk or stand break between meetings. Create a workplace culture focused on health. Get a pedometer and challenge co-workers to a steps-per-day competition, or compete with colleagues to see who can cook a healthy lunch the most days in a row. Does your workplace encourage healthy behavior? What kind of incentives does your company have to help employees stay healthy, fit, and happy? Tell us your story in the comments below or tweet @ShanaDLebowitz or @SophBreene. Greatist Turns Three Today and It's All Because of You! Can Being Religious Make You Healthier? 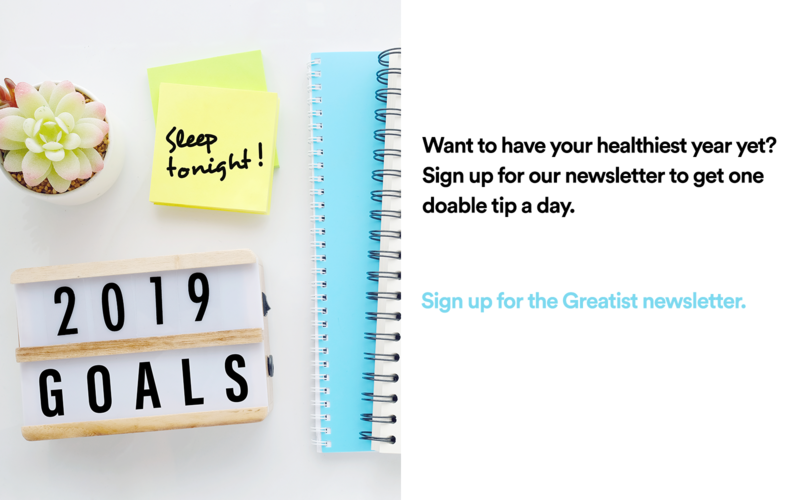 Has Greatist Helped You Get Healthy and Happy? We Want to Hear About It! This year, for our third birthday, we want to celebrate by focusing on YOU.